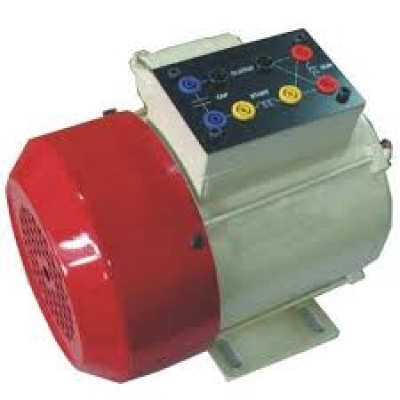 becoming common, the use of 1Phase AC Squirrel cage motor became very common & demand increased for motors with single phase power, as the current in single phase is a concern, hence motors upto 3Hp have been made In Single phase power with the same Induction design principle. These motors have a capacitor in its running winding this means the capacitor is always connected and active while the motor is running. This Model is the Industrial /Educational model suitable for demonstrating to students the complete know of the Basics, Components, Starting methods, Wear & Tear & Maintenance of these motors packaged in small rating. Students can make connections of their own with the help of the terminations provided for study of features viz Starting methods, Speed-Torque, Effect of Phase angle, Study of Cogging/Crawling, Effect of reduced voltage, Blocked rotor test. We are leading manufacturers, suppliers & exporters of Single Phase Ac Induction Motor for Electronics labs for Teaching Equipments Lab. Contact us to get high quality designed Single Phase Ac Induction Motor for Electronics labs for Teaching Equipments Lab for schools, colleges, universities, research labs, laboratories and various industries. We accept bulk orders for government tenders in all countries around the globe.